Liz Blanton, M&E advisor at I-TECH, presents her poster at MetaECHO. On March 13-16, Liz Blanton, Monitoring and Evaluation Advisor at the International Training and Education Center for Health (I-TECH), joined more than a thousand clinicians, funders, academic leaders, government officials, and public health experts for the MetaECHO™ conference in Albuquerque, New Mexico. The University of New Mexico’s Project ECHO® model aims to bring specialized health care and expertise to rural and underserved communities in the U.S. and worldwide. 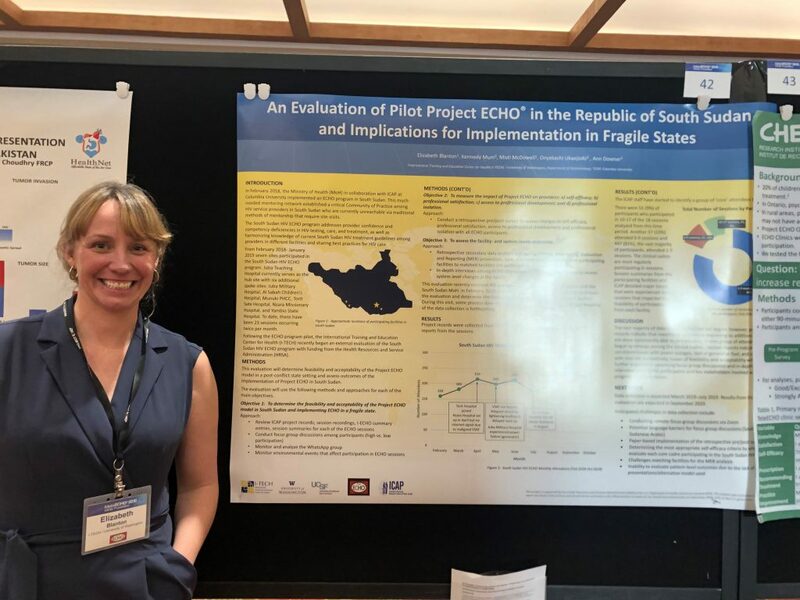 Blanton presented a poster titled “An Evaluation of Pilot Project ECHO in the Republic of South Sudan and Implications for Implementation in Fragile States.” The evaluation, still in its early stages, will assess the feasibility and acceptability of the model, which is implemented by Columbia University’s ICAP and is the first of its kind in a fragile state. It will also gauge the impact of the ECHO model – based on telementoring and case presentation from a panel of experts – on providers’ sense of self-efficacy and professional satisfaction, as well as assess outcomes at the facility and systems levels. In light of this year’s theme of “Infinite Possibilities,” there were also deep discussions about the evolution of the model and how it might be adapted to improve communication between providers and patients, not just among providers. “There were several ‘ECHO Talks’ – TED-style talks – that were really moving,” said Blanton. “Some of the best were by patient advocates,” who highlighted the need for patient-centered care. A fireside chat with keynote speaker Dr. Don Berwick, President Emeritus and Senior Fellow at the Institute of Healthcare Improvement, underscored the question: how can ECHO teams best deliver what patients need? Today, Project ECHO operates more than 220 hubs for more than 100 diseases and conditions in 31 countries. The MetaECHO community encompasses all those dedicated to reaching the collective goal of touching 1 billion lives by 2025. The first I-TECH-supported ECHO program in the Caribbean was established in January 2018, with the hub site in Jamaica. In that initial year, 41 ECHO sessions were provided, with participation by nearly 300 health care workers. Topics centered on viral load suppression and also included a series on TB prevention, diagnosis, and treatment in people with HIV; tenofovir toxicity; and HIV and lymphoma. During an I-TECH assessment, it was found that the majority of complicated cases presented during ECHO sessions in the Caribbean involved patients with mental health and substance use disorders that negatively impact their ability to adhere to medication and care. Plans are under way to include a psychiatrist/mental health specialist on the ECHO expert panel, and one Wednesday per month will be focused on HIV/mental health co-morbidities. The Jamaica Ministry of Health has also requested that I-TECH include an additional 20 HIV care and treatment sites, as well as a small group of private practitioners, in the current HIV ECHO program community of practice. In service of this request, I-TECH will support the development of a second ECHO program based in Trinidad, which will be launched this month. I-TECH is implementing ECHO to build the capacity of laboratory staff and improve the quality of lab services in Côte d’Ivoire. Sessions include up to 17 laboratories and nearly 30 participants apiece; topics have included management of non-conformities in laboratories. laboratory equipment preventive maintenance, best practices in HIV serology, and external quality assurance. In Malawi, I-TECH supports Project ECHO in partnership with the U.S. Centers for Disease Control and Prevention (CDC), the Elizabeth Glaser Pediatric AIDS Foundation (EGPAF), and Lighthouse Trust. The program has more than 40 participants from five different sites, and case presentation topics have ranged from tuberculosis to HIV encephalitis to Kaposi’s sarcoma. Benefits of the program include not only increased engagement of providers to discuss difficult cases, but also an improved referral system between clinics. ECHO is installed and supported by I-TECH at 41 sites in Namibia, and monthly participation reaches up to 400 subject matter experts and staff. Dozens of topics were discussed during the pilot period (November 2015 to September 2016) alone – the most widely attended were on HIV disclosure to children, PMTCT Option B+, and presentation of tuberculosis. In an evaluation of the Namibia pilot, nearly 80% of participants cited that access to the expertise of HIV specialists and inter-disciplinary consultation was a major area of need for them and their clinics. Ninety-three percent of the participants reported that the presentations during the pilot ECHO sessions provided them with useful, up-to-date knowledge.